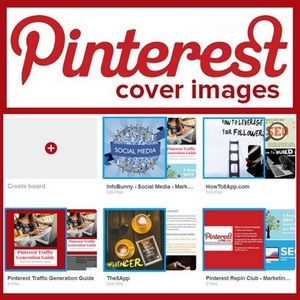 Home » Social Media » Pinterest Board Cover Images – Are You Using Cover Images? Pinterest has a very cool but little-known board feature that is often ignored that we like to call the Pinterest Board Cover Images Feature. When you pin images to a Pinterest board the images are just added one by one as small thumbnails. With the Board cover image feature, you can upload a new pin or select an existing board pin as your main image that displays as the featured cover of the pinboard. Notice how I have selected an image for each. 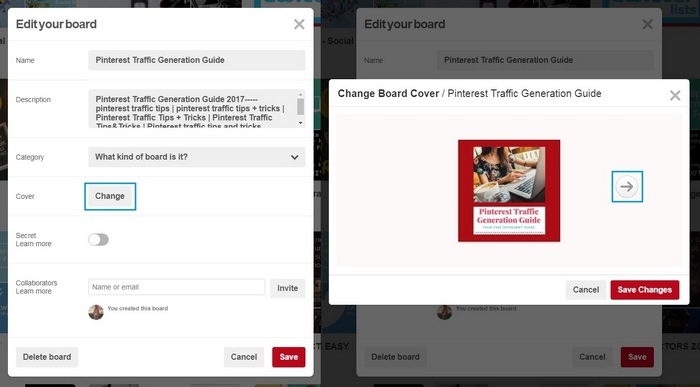 Now, pay more attention to the board called Pinterest Traffic Generation Guide. 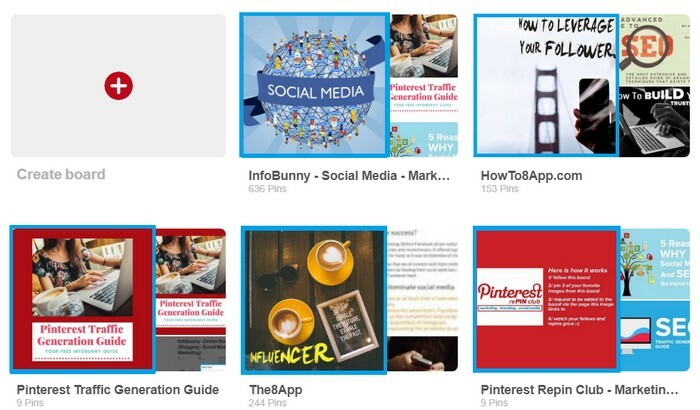 My Pinterest Traffic Guide is a long article that incorporates a lot of images. So because of this, I created a specific pinboard just for this article. I then created an image specifically for that board to act as the board cover image. Why Take Advantage Of Pinterest Board Cover Images? Cover images give you the opportunity to brand your boards and to just make your board page look more professional. If you are a blogger then you could make a series of specific Pinterest board cover images that relate to specific articles. Cover images are a huge branding opportunity for your account and just make you look more professional and after all, Pinterest is all about the visual. Setting up your pinboards is a very simple process. Cover images are square. The minimum size image for a cover image is 340 x 340 with the optimal size being 736×736. Bigger is better on Pinterest so go for the optimal size if you can. 1/ Upload the image that you would like to use as your cover image to your board. If you want to use an existing image then go to step 2. 2/ Click “Change” on the Cover section and the screen capture below on the right will appear. 3/ Arrow across to select the image for your Pinterest board cover image. 6/ Refresh your page to see the new board cover image. For a full guide to Pinterest and how to generate traffic with Pinterest visit our Pinterest Traffic Generation Guide. Or if you are looking to boost your visibility and engagement on Pinterest then check out – How do I boost my Pinterest engagement and visibility? where you will find 7 or so quick tips that will really help you with your Pinterest goals. I hope you found this short tutorial useful. If you did then please leave your thoughts in the comments section below. Yes it makes your profile that bit more professional as your able to brand your image of site. Are we connected on Pinterest? Your tip about using Pinterest cover images is one I started using when I first went onto Pinterest, but I have to confess I haven’t done so of late. Time to head back over there and spruce up my boards! Thank you Kathryn. Have you checked out our Traffic Guide to Pinterest yet? Very helpful article for Pinterest enthusiasts. I am one! I saved all the steps and will be changing all my boards this weekend. Also going to be taking a Pinterst course soon so good time to fix up my boards. Thanks for the tips! Yes, I was aware of Pinterest cover images and we created ours quite a while back. Don’t know why we bothered since I rarely visit Pinterest or post to it. I use cover images but it’s always nice to see how others are being creative with this site. Pinterest is not a priority for me but I stay involved because of my emphasis on creating unique images for my posts and a surprising number of people pin and share them each week. Thanks! Excellent article, Thanks for sharing your article.